We always have at least 2 or 3 rolls of plastic wrap in our house as I’ve found it comes in handy SO often (and not just in the kitchen). This stuff is amazing, and although it’s more expensive than traditional plastic wrap, I ALWAYS keep it in the house and I regularly come up with different uses for it. I do a lot of painting — in fact, in the last month, I’ve repainted 2 bedrooms, 1 bathroom, 3 pieces of furniture, and the trim in 3 rooms. Since I almost only paint when the kids are sleeping, it usually takes me a couple of nights to finish a project. In between painting sessions, I cover my brushes, rollers, and any other painting supplies with Press ‘n Seal wrap and they stay good for days. This means I only need to wash out my brushes and clean up one time instead of every single time I finish for the day. I’ve been using this tip for YEARS and it’s a huge time and money saver! Paint trays are usually $5-$10 depending on what kind you buy. Then, the liners are usually around $1 each. This might not seem like that much, but when you paint a lot with many different colors, that cost can add up. Plus, for some reason, I seem to ALWAYS buy the wrong size liner for my paint trays! Thankfully, I solved that problem about 6 years ago when I realized that Press ‘n Seal wrap was the PERFECT alternative to paint trays — and it only costs pennies. Simply line your paint tray with Press n’ Seal (pressing it down very firmly), pour your paint in, and you’re ready to go. When you’re finished, just pull up the Press ‘n Seal and toss it in the trash. 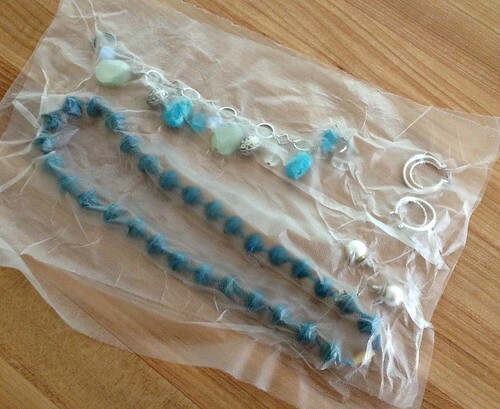 Whether you’re traveling for the summer or just bringing a change of clothes for an event after work, you can keep any jewelry you’re bringing along completely tangle-free, neat, and organized by laying it on a piece of Press ‘n Seal wrap and then putting another piece over top. Simply press all around the edges of each jewelry item, then roll it up and place it in your bag. Even though I don’t wear a ton of jewelry, this is an awesome trick that I’ve used frequently over the years! If you are constantly battling sticky, dirty, grimy refrigerator shelves and drawers, try lining them with Press ‘n Seal wrap first. 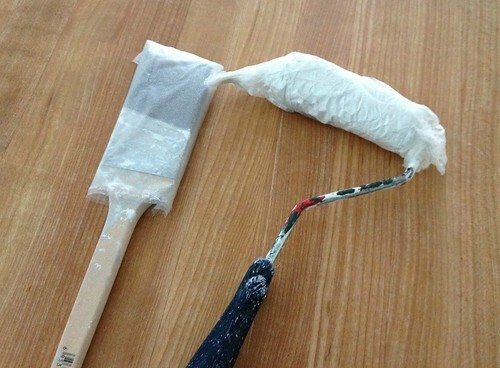 Then the next time you spill, simply pull up the plastic wrap and put another layer down. We ALWAYS have multiple varieties of ice cream in the house. And although we keep it all downstairs in our deep freezer before we open it (the deep freezer is better to prevent freezer burn), once we open a container, we bring it up to our normal freezer. When we do this, we will often cover the surface of the ice cream with Press ‘n Seal wrap and then put the cover on as it definitely does a great job of extending the life of our ice cream and preventing freezer burn. Plus, it only takes 5 seconds, so it’s totally worth it! For those of you trying to transition your kids from a sippy cup to a regular glass, this tip is genius (especially if you’re out and about or at a guest’s house where you don’t want them to spill). 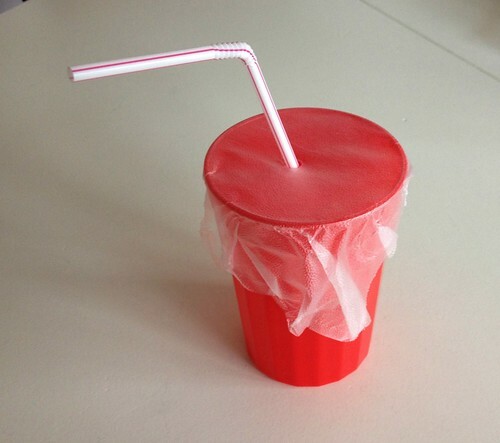 Simply cover an adult drinking glass with Press ‘n Seal wrap and poke a straw hole through the center. They can sip away while you enjoy your time without constantly worry about them spilling. 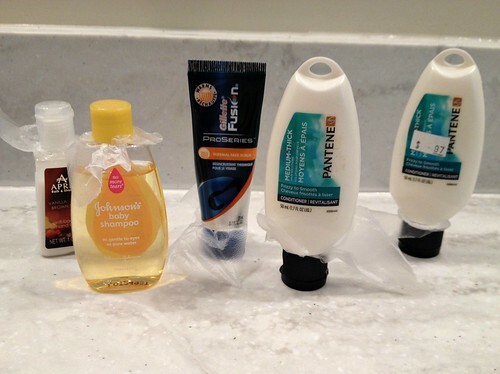 Have you ever packed sunscreen or lotion or any other liquidy item for vacation… only to discover that item leaked all over your suitcase? If so, the next time you travel, take a few minutes to wrap the tops of your liquidy items in Press ‘n Seal wrap and THEN screw on the top. You most likely won’t have any issues with spills. There was a time, before we had kids, when I grew many of my flowers and vegetables from seeds. I would put them on heating blankets in our living room, cover them with Press ‘n Seal wrap, and put them by a sunny, south-facing window. It worked like a charm — and SO much better than any other frugal method I tried. Someday, I’ll try this again with Nora — but it will definitely need to wait until we don’t have busy toddlers and curious babies around to play in the dirt! When I’m painting, gardening, or going for a walk when it might rain, I’ll often wrap my phone in Press ‘n Seal wrap to prevent it from getting dirty, messy, or wet. I can still use the touch screen even with the plastic wrap on top — and I like the extra layer of protection! I read this tip a long time ago and although I don’t do it all the time (because we eat bananas so quickly) I will say that it does work. 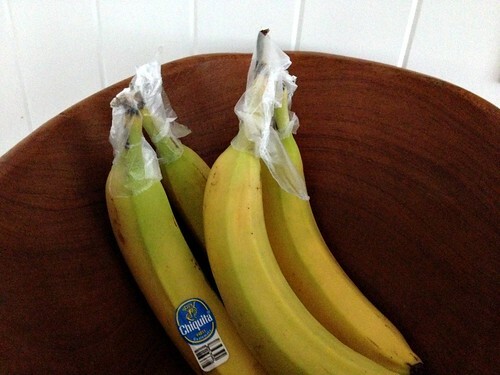 If your bananas are going bad too quickly, I would definitely suggest giving this a try. Or, you could always just toss them in the freezer for banana bread or smoothies! 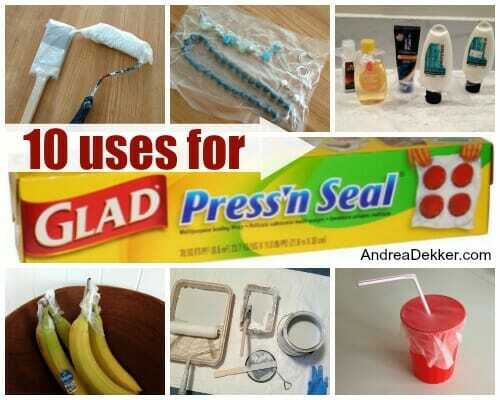 So there you have it, 10 of my favorite non-food ways to use Glad Press ‘n Seal wrap. I’m guessing I use it at some point every single day because it’s just SO handy… and at roughly $3 a roll, it’s a pretty frugal “fix” for so many daily household issues! Do you have any other clever uses for Press ‘n Seal? Filed under: Home • Misc. Can the Glad Press n Seal be reused – if I use it for jewelry packing, can you open the “pack” wear the jewelry and then reseal in the same piece several times?? Thank you for any info you can share! sometimes it rips when you peel it apart, but if it doesn’t rip, then I don’t see why you couldn’t reuse it. I use Press’n’Seal to store partially used batteries for Christmas decor (ornaments, candles, garland, music-playing stuffed animals, etc…). This works for “regular” batteries (like AA) as well as button batteries. I put batteries for each item in its own little Press’n’Seal packet, put each packet in a small ziplock bag, and label the bag as to what ornament, etc… it goes to. I store all the little packets in a plastic container in a cool place and pull it out when it’s time to decorate for Christmas. This way I can use the same batteries for the same item each year until the batteries wear out. This prevents me from wasting batteries, saves money, and ticks off other guidelines for storing batteries (store like batteries with like (AA together, button together), prevent positive and negative terminals from touching each other, store new and used batteries separately from each other, etc…). I love the suggestion for using Press’n’Seal for travel jewelry! great idea — thanks for sharing! Draw a quilting design on Press n Seal with marker; press on your quilt; stitch over design and tear away after stitching. oh this is SUCH a great idea! Thanks for sharing Linda! While undergoing chemo, I used Press’n Seal to keep the lidocaine cream in place until it was time for my port to be accessed by the infusion nurse. The clinic did provid me with Tegaderm bandages, but my skin reacted to the adhesive. Press’n Seal was much easier to use and didn’t irritate my skin. Use as a plastic cap for hair masks or dye. Apply pieces to exterior of windows to prevent bird strikes. (You may need to secure with tape) The birds see something solid there and hopefully turn away. Not very aesthetically pleasing, but worth saving the life of a bird! I should add that I only do this when there is heightened bird activity around my house. The press n seal comes down when the activity dies down again. yes, that’s a good one too! Great ideas! I never thought of any of these before, but will definitely be implementing many of them in the future. Especially the paint brush cover. I’ve been taught to use plastic grocery bags wrapped with a rubber band for the same purpose, but I think I like the press n’ seal better. Great paint ideas, and ideal timing I am about ready to start a paint project in three rooms and a vanity. What paint do you like to use? How overdue is Baby Dekker? Hang in there! I have an elderly friend who was going on vacation with some family, so her daughter packaged up her daily meds in the press and seal. Then she labeled them by day and time; Monday morning, lunch, etc. It made it easier for her family to help her with daily meds. So it worked fine until for some reason we got a freaky rainstorm here and I needed to figure out a way to keep his dressing dry and still let him roam and sniff out back. I tried putting his foot in a Baggie and taping it and it was a disaster. Then read this post! Said to self, did I not buy some of that stuff many years ago and stuck it in the bottom of the bags and wraps drawer? Yep it was still there. Made a perfectly great boot for the teeny foot of my pooch. Today, it’s back to 90 and blazing sun so everything is dry. Rain only succeeded in spotting the windows I just washed on Monday. Been checking back looking for arrival of baby! Well I’m off to do the windows again but hoping someone will post his arrival either here or FB. My baby girl was a week late and I was getting very very ready to pop her out. She apparently was also since I had a very short labor and five big pushes. Wishing you the best birth ever. Short and sweet!! Thanks for the press n seal tip, we all thank you human and canine alike. I was just at the doctor and he said to use Press and Seal to cover an open wound to protect it in the shower. Just another random use! While this tip isn’t something that I expect anybody on this site to use, I though it was such a unique use that I had to share it. I work at a hospital and many of the kids have central lines (basically bigger IVs that can stay in place for months/years). The lines and the dressings can’t get wet, but the kids still need to shower, so we wrap Press n Seal around the lines! Most parents/kids prefer it other stuff, even specially designed medical shower barriers! wow — that’s awesome Jackie! So cool that a common grocery store product is helping hospitalized children! I hope the people at Glad somehow see this post and read the comments!! I LOVE Press-n-Seal too! And, even though it’s more pricey, I can get it MUCH cheaper–and in larger rolls–at our local warehouse club! you and thousands of other people… everyone is waiting! also, when you say “warehouse club” do you mean Costco and Sam’s? And, yes, here in Baltimore, we use BJs, but it’s essentially the same thing and the Press-n-Seal is SOOO much cheaper that way and I can get two large rolls at once. Plus, unlike other warehouse clubs, BJs accepts manufacturer’s coupons. So, on the off chance I can snag a coupon (I don’t bother with them usually. ), I can get it even cheaper. And, I can use TWO coupons since it’s a two-pack! we don’t tell ANYONE when we go to the hospital either — only my sister since she lives down the road and will be the one watching Nora and Simon. We don’t even call our parents until we are in the “recovery” room because I just like having a little time alone with the baby. Hopefully we can do it the same way again this time! Costco has giant packs of it! Totally one thing I get there. When moving you can wrap your clothes all together in the drawer to keep from having to box up all your clothes. Once, when moving across town, I simply put Press ‘n Seal over the tops of my dresser drawers and moved them with the contents still inside. Lazy, yes, but in my defense, I was 9 months pregnant when we decided to buy our house! Yup, I’ve done that before 🙂 Not at 9 months pregnant either so I don’t even have that excuse! Hi Andrea! Do you have any thoughts on painting safely while pregnant? 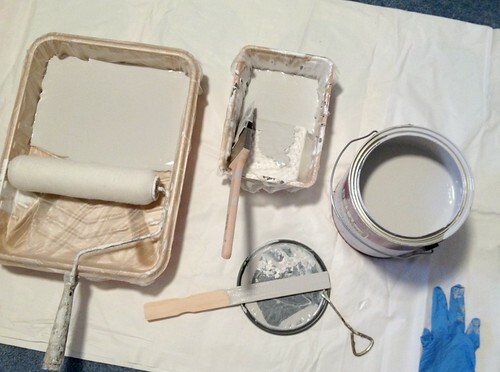 I have a number of painting projects I would love to get done before baby arrives. Thanks and love your blog! I’m probably not the person to ask because I’ve never worried about painting or really doing any type of house project while pregnant. We’ve worked on massive house projects and done tons of painting through all 3 of my pregnancies with no issues. I know most of the paint out there today is SUPER safe for use around pets and kids so I’ve never been worried about it.